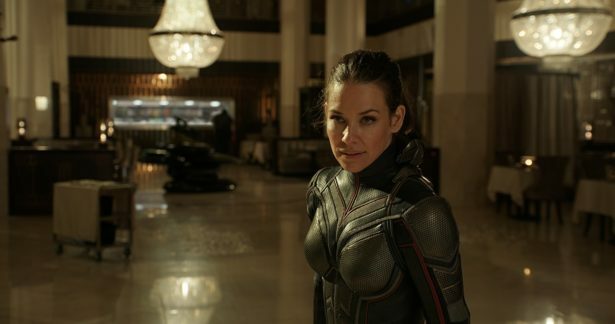 Evangeline Lilly faces a rare challenge in the MCU. After playing Hope van Dyne in the first movie, she now has to make us believe she's the Wasp without any of the safety nets superheroes usually get. She doesn't get thirty minutes in a cave developing weapons tech and learning valuable lessons about empathy. She doesn't get a first act all to herself like Scott Lang does to morph from thieving deadbeat dad to super-suited, thieving, half-deadbeat dad. She doesn't get to dive on a grenade to earn secret serum. Or gamma radiation or ghastly spider bites or God status. Lilly must make us believe in Hope without the transmutation and the training montage. Compared to the Iron Mans and Captain Americas of the Marvel world, Wasp's origin on screen was quick as a finger snap. It was a coda at the end of Ant-Man in which her father finally, finally, finally gave her a super suit to bust heads with, and she said what we were all thinking: "It's about damn time." It was the release valve on the movie's frustrating core element (a stodgy genius looking everywhere but right in front of him for someone to take over his shrinking legacy), but it was also an emotional microscope into Hope's guiding motivation. "Hope is generally not okay inside," Lilly tells me on an Ant-Man and the Wasp set visit Nerdist attended with other outlets. "But what I think is exciting about playing the Wasp is there is this incredible...satisfaction...in Hope. Something that she has been waiting for her whole life, which is essentially affirmation from her father, has come. It came in the form of this suit, so now that she's wearing it and she's exercising those muscles that she wanted to exercise her whole life, she's in a really different place emotionally when we start the film." She lets out a deep sigh between incredible and satisfaction that mirrors the feeling of watching that scene at the end of Ant-Man. It'll have to do, because it's as good as an origin story that the Wasp is going to get. Fortunately, Ant-Man and the Wasp is primed to explore her historical pain by returning to its origination. Three years after Lilly willed Michelle Pfeiffer into being her superhero mom ("Having Michelle Pfeiffer as my mom was kinda one of my geek fantasies..."), the band is getting back together to rescue Hope's mother Janet from the Quantum Realm. They look to make right a tragic, heroic accident that shattered Hope and created Hank's profound fatherly protectionism...which further shattered Hope. "It's two years after you last saw Hope van Dyne," Lilly says. "A lot has happened in two years, and a lot that you, unfortunately, don't get to see that I personally would love to see. Instead of seeing her evolved into a superhero, I think that the leap we take with the audience is we all believed by the end of Ant-Man she's ready to be a superhero." She's right. Her intelligent, knockout performance in the first film makes it easy to believe she belongs in the suit. Without a true origin story, Hope was also left without a mentor to show her how to be a hero. No wise voice reshaping her philosophical outlook. No Avenger explaining the technological gewgaws that form her abilities. No guiding hand to teach her that great power and great responsibility are a package deal. In fact, she was Scott Lang's mentor when it came to fighting. In a sense, she'll have to do the whole hero thing in reverse, by putting on the suit in order to search for that mentor, which may be her father or, more likely, will be her mother. If it's Scott Lang, the whole world's in big trouble. There's also one more glaring challenge facing Lilly in the Marvelsphere. A unique one. She's the first female superhero to have top billing in a movie. She's sharing it, but that's her character's name right there in the title. Not as the token member of an ensemble, but as one half of an equal partnership. Way, way back in an interview for the DVD/Blu-ray release of Iron Man 2, Marvel chief Kevin Feige announced that they'd had conversations with Scarlett Johansson about a standalone Black Widow moviee that would have to come after The Avengers (remember that classic?). He has nodded toward the possibility every year (mostly because he keeps getting asked about it), again restating in 2016 that they were creatively committed to giving the superhero spy her own film. They've hired a writer and everything, but it's unlikely we'll see it before 2021. Through Avengers: Infinity War, that's 19 movies, Marvel has exactly zero movies focused on a female superhero. Until they break that streak with Captain Marvel in 2019, presumably with an origin story and everything, Wasp is the closest thing they've got, and Lilly has worked hard to stand out from the -Man crowd. "I do mitts 'cause I love them, and she needs to be able to punch and not look like she can't punch. Not look like Scott Lang when he punches," Lilly says with a laugh. "I'm also finding the personality for the stunt people. So we work together in front of a mirror, and we'll try different things together. They might do a fight move that looks exactly the way you would actually want to injure someone, and I'll say, 'Okay, but wouldn't it be pretty if throw some flare into there that gives it the flavor of the comic books?' I don't know if any of you've spent some time looking at Wasp images, but she is very, very graceful in the comic books. She's very feminine. She's not, you know..."
This is when Evangeline Lilly thrusts her fists as far as she can from her face in the Notre Dame Fighting Irish mascot stance. "...She's got pointed toes and long limbs, and she's very elegant. Marvel are very good at modernizing their superheroes, but I always think you want a taste of the original 1960s character you first fell in love with. So we're really trying to do that with the fight style." With that signature method of bashing bad guys and some suit enhancements Ant-Man didn't get (no complaining, please), Wasp is poised for greatness despite being initially shortchanged in the origin story department. (To put it more bluntly: in the standalone movie department.) Lilly and the Wasp have to grab superhero status on the go. It's a shame that she and the character are in that position, but it's also a fantastic opportunity to shine that Lilly is grabbing with both bloody-knuckled hands. Even without the lengthy backstory, is there anyone who will doubt her when she puts on the suit for the first time? Lands her first uppercut? Drops some wry one-liners? Boldly states the underlying principles of her heroism? The Wasp faces a rare challenge in the MCU, but it also means she gets to define her own origin, to be her own mentor, and to craft her own style. It's about damn time.